Enjoy a fantastic, custom, private, full day trip/tour from Toronto, Canada to wondrous Niagara Falls, Canada in a private, casually upscale vehicle. Downtown Toronto Hotel/Air BnB/B&B/Residential pick up/drop off. Includes the beautiful, old town of Niagara-on-the-Lake. You can wander, shop, eat and see all the sights. Enjoy tastings at 2-3 Niagara Region wineries of your choice, if you wish. Then down the parkway and off to Niagara Falls, Canada "The Wonder of It All." A great adventure, this tour is a minimum 8-hour day full of activity. Your guides are born and raised in Niagara and know the best wine routes and restaurants, and all the ins and outs of what makes Niagara so unique. Not to be missed! Create as many memories as you can on this custom, private, full-day tour of Niagara-on-the-Lake and Niagara Falls, Canada. Your driver/guide will pick you up and drop you off at your Downtown Toronto Hotel/Air BnB/B&B/ or residence and help you create an amazing world-class experience, that is just for you and all about you. Travel in an upscale, private, vehicle exclusive to your group. It will take about 8-9 hours and will make for an extremely memorable day. Following pickup, you will travel around Lake Ontario, to the Prettiest Town in Canada, the quaint, beautiful 'Old Town' of Niagara-on-the-Lake, Ontario. You can wander, shop, eat, sip and see all the sights. Enjoy tastings or dine at 2-3 nearby Niagara Region wineries of your choice, if you wish. Visit the chocolate factory or quaff a cold one at one of our working micro breweries. Experience Queens Royal Park. From here, journey down the renown, scenic, beautiful Niagara Parkway, stopping for several photo ops, visit Queenston Heights Park, climb Brocks Monument, all on your way to Niagara Falls, Canada. Experience the amazing depths of the Niagara Gorge and the breathtaking views of the winding Niagara River. Enjoy the ride into our town, we'll drive past Oaks Garden Theater (we can stop if you wish), through Queen Victoria Park and soon view the spectacle of the waterfalls. See the wondrous Rainbow Falls (American Falls), the Bridal Veil and the spectacular Horseshoe Falls (Canadian Falls) in all of their glory. Experience the power of Mother Nature for yourself. Take in as many attractions as you wish and create as many memories as you can. View from Table Rock, Walk Clifton Hill (The Hill of Fun), go behind the waterfall (Journey Behind the Falls), ride the Hornblower Cruise (Maid of the Mist), ride the SkyWheel, ascend the Skylon Tower to the observation deck, take a Helicopter Tour or if you dare experience the Whirlpool Jet Boats. Wheelz Niagara will make all of the arrangements. 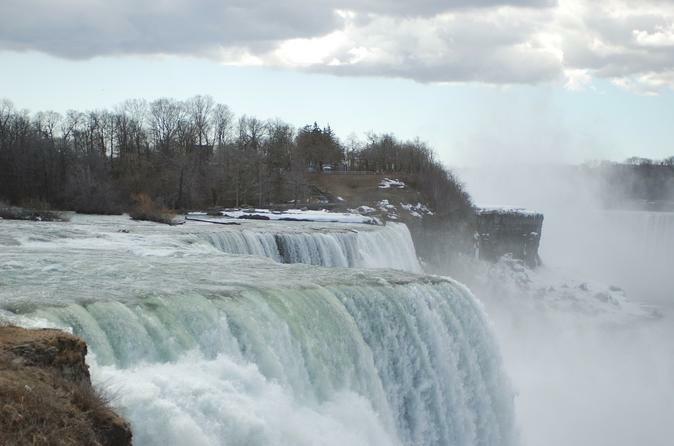 Niagara is the most dynamic four-season destination in the world. The region boasts 20 historical museums, beautiful lakeside beaches, more than enough world class golf courses to satisfy even the most avid golfers, some of the world's most exciting indoor water parks, the Butterfly Conservatory, natural hiking and cycling trails, and over 100 world-renowned wineries. On your tour, plan to experience Niagara's wonder, majesty, entertainment and excitement.